The government has issued an air quality warning in Australia's drought-stricken New South Wales. The warning was prompted by a massive dust storm measuring around 500 kilometers (310 miles). Some residents were forced to don masks as the dust storm severely hampered the air quality. In some areas, the dust storm has reduced visibility to just meters including western NSW at Darling River and Broken Hill. 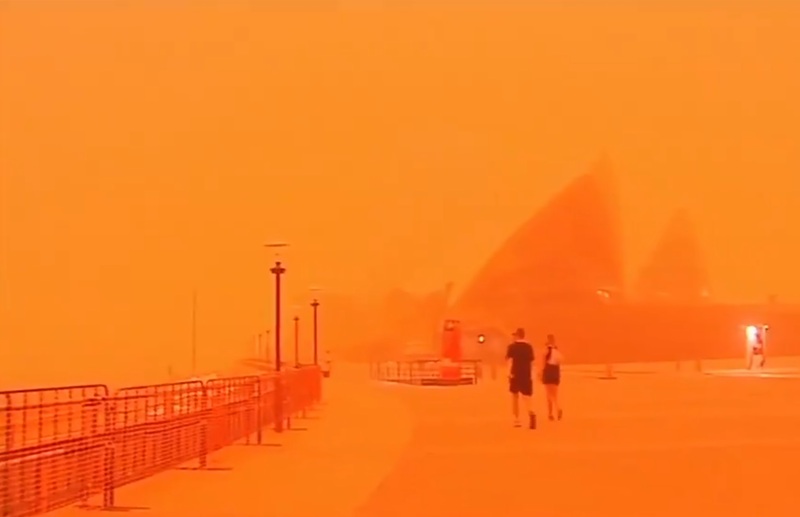 The massive clouds of dust had moved into iconic locations in Sydney such as the Opera House, Sydney Harbour Bridge, and Bondi Beach. Australia's west has also seen deteriorating air quality. Even the U.S. Marines stationed in Australia's Northern Territory were affected by the dust storm. The USMC posted an update on Twitter with a photo showing drills carrying out despite the dust storm. Jordan Notara, a forecaster for the Bureau of Meteorology (BOM) said the bureau could offer no insight as to how intense the dust storm could become. "We may see some red afternoon skies," Notara told abc news. One thing that Notara could say about the dust storm is that it is reminiscent of the major dust storm in Sydney in 2009. The "Weatherzone" tweeted their own forecast for the next couple days down under saying, "The sun rises over a deep low-pressure system and large pool of cold air moving over the Bight. This system will cause showers, thunderstorms, damaging winds, hail, snow and dust storms as it crosses southeastern Australia during the next two days." As far as airport operations, Sydney Airport has been forced to use a single runway. The airport tweeted an update saying, "International and Domestic terminals are experiencing some flight delays". Australia's "Office of Environment and Heritage said that air quality has already deteriorated to a "hazardous" level". Director of Environmental Health Dr. Richard Broome said, "Some of the dust particles in the dust storm will be very small and can get deep into your lungs and that's why we're concerned about people's health." He also warned residents, "If possible, stay in air-conditioned premises where filtration systems can help to reduce dust particles in the air." "Dust may aggravate existing heart and lung conditions and cause symptoms like eye irritation and cough."